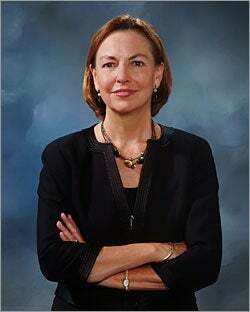 Gloria Larson is president of Bentley University, chair of the Greater Boston Chamber of Commerce, and a member of the board of the Massachusetts Women’s Forum, a group of 100 top female executives in the state. She has served in a variety of prominent government and civic roles, including overseeing construction of the Boston Convention and Exhibition Center and co-chair of Governor Deval Patrick’s transition team. She recently spoke to former Globe reporter Sasha Talcott about her career, the college students of today, and how volunteer work can pay off in unexpected ways. Q: You have switched sectors several times over the course of your career – from government to a law firm (Foley Hoag) to academia. What advice to you have for someone interested in making that kind of switch? A. It’s funny for me to look back retrospectively on my career because the single conclusion I can draw is that I apparently can’t keep a job. I have made what from an outsider’s perspective would look like a number of career switches. For me they’ve all been linked together through a lifelong love for public policy. I love the intersection between business, government and the broader society. My advice to others would be: Don’t get caught up in just what your head tells you in an analytical way about your career. Be really open to following things that are aspirational for you – and bring real meaning to what you’re doing. Q: If you were just starting out in your career, or were mid-level, what would you do differently? I spent 45 minutes outlining for him five other people I thought would be outstanding and all the reasons why. At the end, he cut me off, and he said, “Well, I actually invited you here to talk about you taking over, but now I’m not so sure – because obviously you don’t think you’d be the right choice.” I had to spend the next 20 minutes digging myself out of that hole. I learned a really valuable lesson: There’s a big difference between being arrogant about your skill set and always taking a back seat, failing to seize opportunities that you are the right person for. Q: As President of Bentley University, you work with a lot of students. What do you think are the strengths of today’s undergraduates, and in what areas do you see room for improvement? A. My students are beyond awesome. I believe the world is going to be in very good hands. They really get that they have a broader responsibility than just quarter-to-quarter profits. The students are more mature than my generation was; they have more real-world experience than my generation did. I didn’t give a thought as an undergrad as to what I’d do for a living. In fact, my realization upon graduation was that I had to go to law school, because I needed to learn something practical to earn a living. These kids already get that – they’re very attuned to the bigger world. If I see something that bemuses me about this generation, it’s that they know how good they are. When they leave school, they’re going to have to work their way up the ladder, as opposed to being in a corner office in just a few years. They’re going to have to pace themselves. I think there are any number of my undergraduates who might want my job, and at some point I think they should have it – just not next week. I’m so excited by their sense of energy and enthusiasm. I think honestly the pacing will come when they get into the real world. Q: What career advice do you have for the next generation of leaders? A. Believe in yourself. Believe you have the capabilities to excel in whatever organization you join, and also to do more than that: Be a really engaged member of the larger community. One of the things I see at [Bentley’s] business school is how critical it is not be focused simply on core skills. Of course you need to master a particular set of skills – that’s more and more important. But, at the same time, I would urge everyone one not to lose the broader sense of humanity and the broader landscape that comes from studying arts and sciences. Q: You were No. 1 on the list of Boston Magazine’s most powerful women. What does it take to be powerful in this city? A. No one was more surprised than I was that I was on the list, never mind No. 1. When I really thought long and hard about why I might be – rather than it was just a random roll of the dice and someone made a mistake – beyond those answers, the fact that I’ve accrued any sense of power or any real voice in our community, has had more to do with my volunteer work than with my professional career. Sasha Talcott is one of five co-founders of a mentoring and networking group for emerging female leaders, Tomorrow’s Women TODAY – The Boson Women’s Leadership Council.